The River Avon (pronounced A’An) is the largest tributary of the River Spey and attracts good runs of salmon, grilse and sea trout which start appearing in late April until the season ends on 30th September annually. Over 4 miles of the best water with fishing on both banks from Livet Mouth downstream to Butler’s Pool below the Bridge of Avon have been divided up in six beats known as the Lower Beats. Each beat is fished by 2 rods on a daily rota system. There are over 30 named pools on these beats which may be fished twice during a week’s stay at Ballindalloch. Good access to the river has been provided for vehicles and most beats have small fishing huts. From Livet Mouth upstream to the march with the Crown Estate fishing is from the left bank only. This stretch of water is known as Beat A and is let separately. Fishing is let by the week but day permits may be issued if there are any rods available. 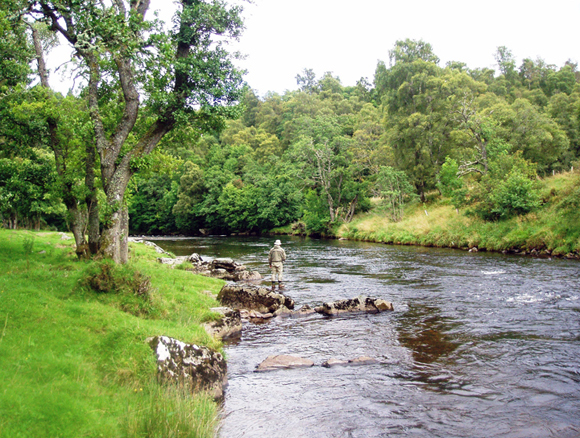 The Avon is not a big river although Speycasting is an advantage in a number of pools. Consequently a light double handed rod is recommended circa 12 ft.
On the main river the ability to cast a long, delicate line is a distinct advantage. Flies:- Munro Killer, Ally Shrimp, Willie Gunn, Stoat, Silver Stoat, Blue Charm, Collie in a range of sizes would be a fairly typical starting point for a box of Spey flies. Cottage accommodation is available on the Estate. Please contact us for further information. Alternatively for those not wishing to self-cater, the Delnashaugh Inn is on the estate and conveniently situated near the river at the Bridge of Avon. It has eight twin bedded rooms with en-suite facilities and one double room with an adjoining private bathroom.